One of the most poignant images of the Titanic disaster is of a young newsboy outside the White Star Line offices in London, holding an Evening News poster announcing ‘Titanic Disaster Great Loss of Life’. The newsboy was Ned Parfett, born in 1896, and one of four brothers from Cornwall Road, Waterloo. Tragically, six and a half years after this picture was taken, Ned was killed while serving with the British army in France. He was 22. Ned enlisted in the Royal Field Artillery in 1916, serving as a despatch driver then moving onto reconnaissance duties. He was awarded the Military Medal and mentioned in despatches for his gallant conduct during a series of missions at the front. 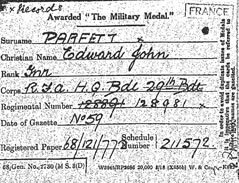 Ned Parfett is buried in the British war cemetery at Verchain-Maugré in France.